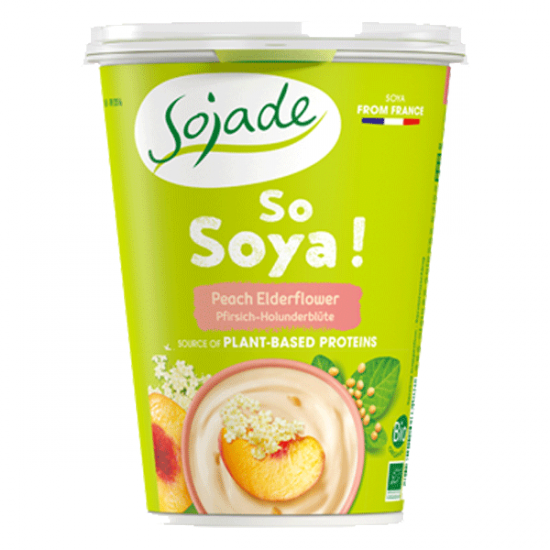 Soya drink* 78% (water, hulled soya beans* 9,2% (France)), peach* 10%, raw cane sugar*, wheat syrup*, thickeners: pectin – locust bean gum – calcium citrate, natural flavourings*, acidity regulator: citric acid, selected live cultures of which Bifidus and Acidophilus, elderberry flower extract* 0,01%. * Organic farming. Wheat syrup guaranteed gluten free.